I’ve been cooking my way through Maria Emmerich’s new cookbook, The Ketogenic Cookbook . I’ve been eyeing her paleo onion rings recipe for a while, but there’s so many great recipes in there I just never got around to trying it out. 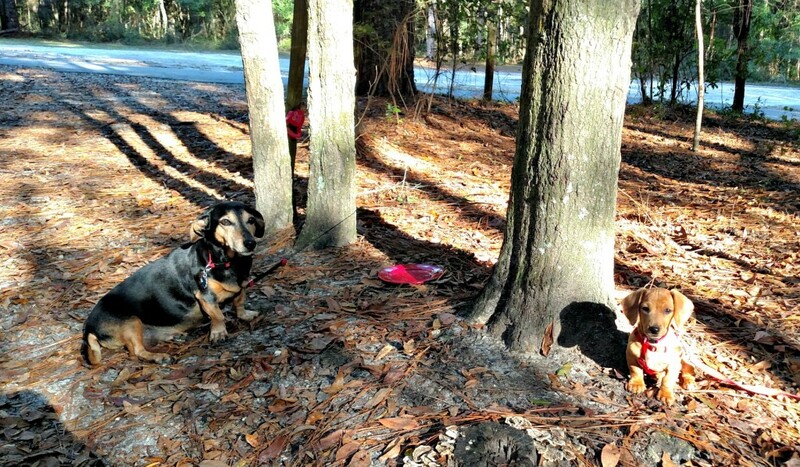 But last weekend, my husband, myself, and my three furry children went camping in the RV. I figured that the bacon onion rings recipe would go great with the steaks we were planning on grilling. In Maria’s recipe, she bakes the rings, but I thought it could be adapted to grilling. I will not grill on a public grill (or any grill for that matter) without using my Kona mat . I don’t have to worry about cleaning the grill, stuff won’t stick, and nothing small falls through the cracks. Since I had the mat, I knew I’d be able to cook my bacon wrapped onion rings without them falling apart and falling in the fire. Maria suggested serving the bacon onion rings with a hollandaise sauce, but I wanted something a little more Southern. I decided to make a low carb honey mustard dipping sauce to go along with it. 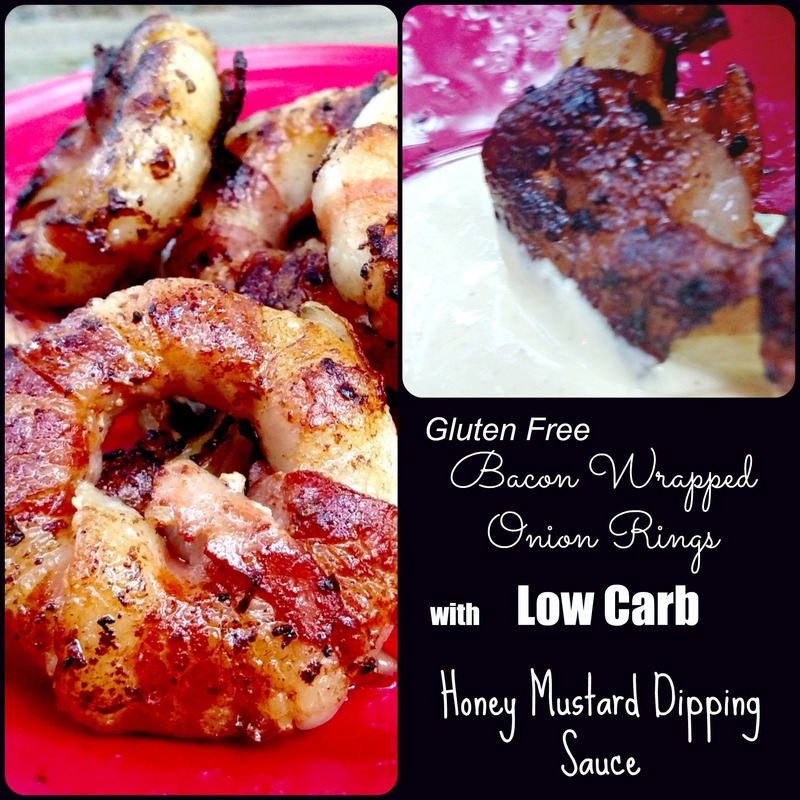 When the bacon onion rings were cooked and I dipped one into the honey mustard sauce, oh my gosh! I was in heaven. 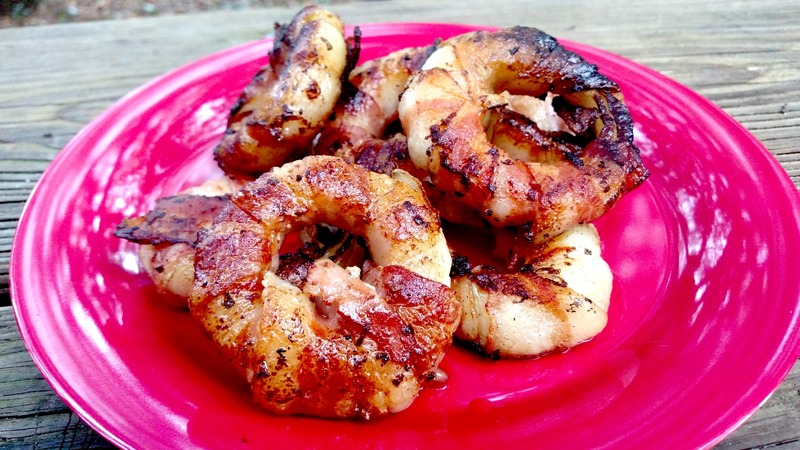 I have to admit, one of the reasons I’d been putting off making this bacon onion rings recipe was because I thought it was going to be tedious to make. It turned out to be easier than I thought! First, I started my slicing the onions in really thick slices. Then I poked out the middles, leaving about two to three rings per onion ring. Don’t throw away the middles! You can use them in other recipes later. Next, wrap each onion slice with bacon. It takes about two bacon slices to cover a large onion slice. It looks labor intensive, but it’s really not. I was done in about 10 minutes. At this point, though, my husband was really thinking I was wasting a pound of bacon. Place them on your grill and cook until crispy, then flip. 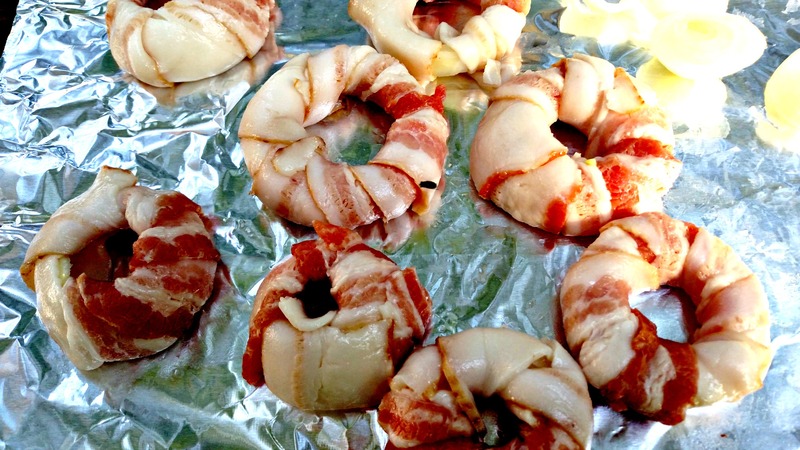 If you’re cooking your bacon onion rings in the oven, bake at 375F for 30 minutes or until crispy. My hubby was still thinking this wasn’t a great use of bacon. The peanut gallery, though, knows a good thing when they smell it. It took about 20 minutes to get all the bacon wrapped onion rings to my desired crispness. 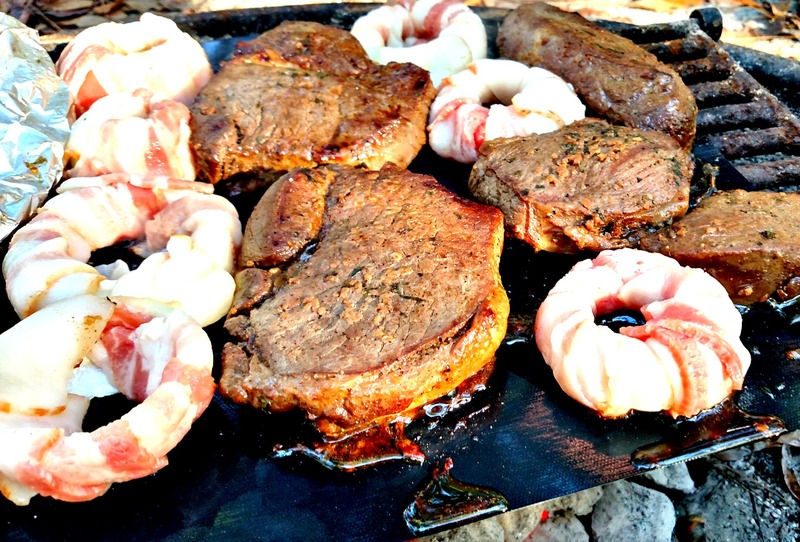 I served them with my grilled steak and low carb honey mustard dipping sauce. Preheat oven to 375F. Line a 9x13 baking sheet with parchment paper. Slice the onions into thick rings. 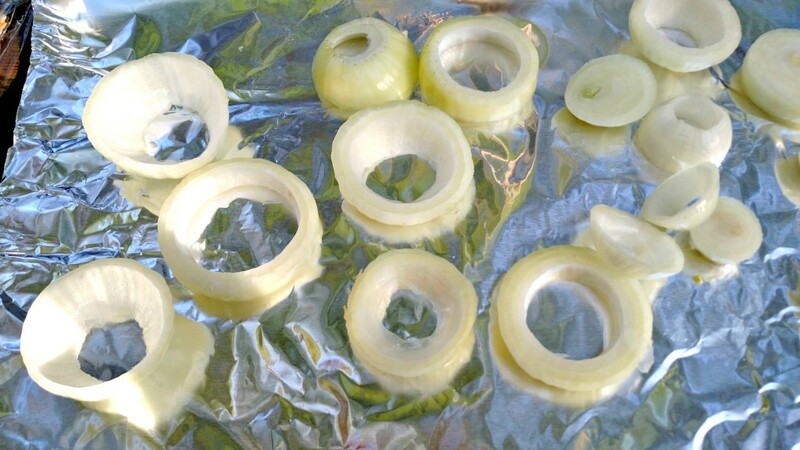 Save the small inner rings for another recipe. Wrap each onion slice tightly with bacon. You can secure it with a toothpick if they begin to fall apart. Bake for 25-30 minutes, or until crispy. In a mixing bowl, combine all ingredients and mix well. Cover and refrigerate before serving. Looking for a gift for a gluten free foodie on your list? 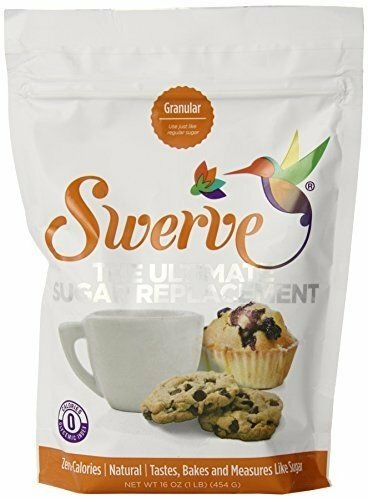 Gluten free gifts for Christmas can be hard to find. And if you’re not gluten free yourself, it’s hard to know what food options there are, or even what they might want. 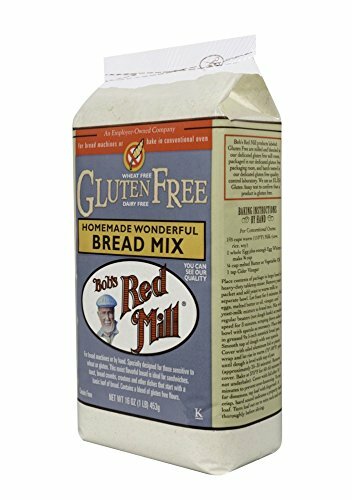 I’ve been gluten free for about three years now, and I want basically what everyone else wants as gifts. 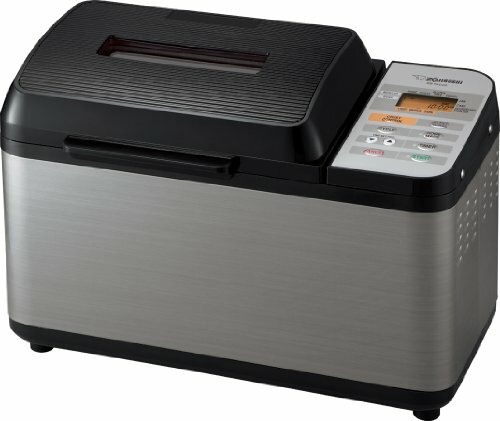 I want to be able to eat great tasting food, and have products that make my life easier. 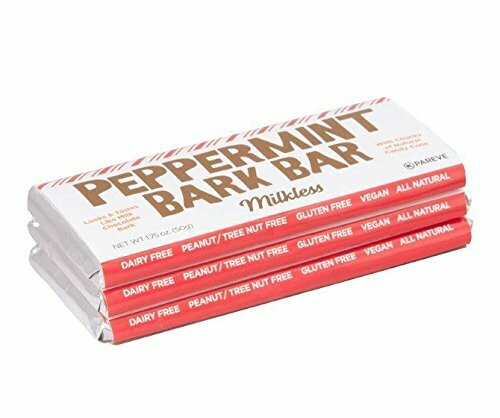 Consider this an insider’s gluten free gifts Christmas list if you will. I’ve put together a gift guide that will hopefully take out the guesswork and make gluten free shopping a little bit easier for you. 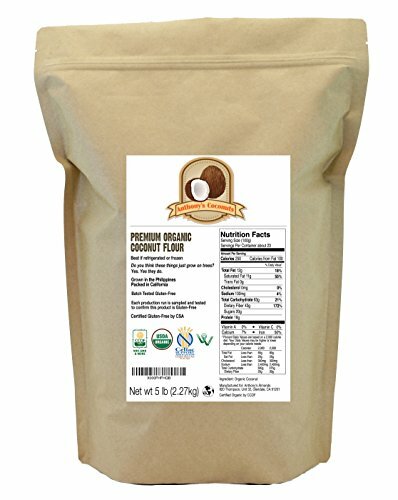 Best Gluten Free Gifts for Christmas? 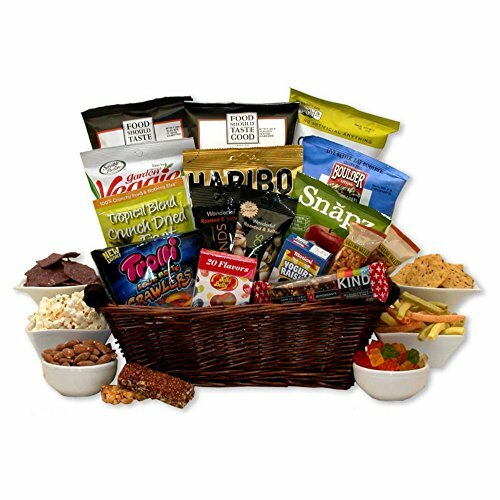 Gluten Free Christmas Gift Baskets Of Course! 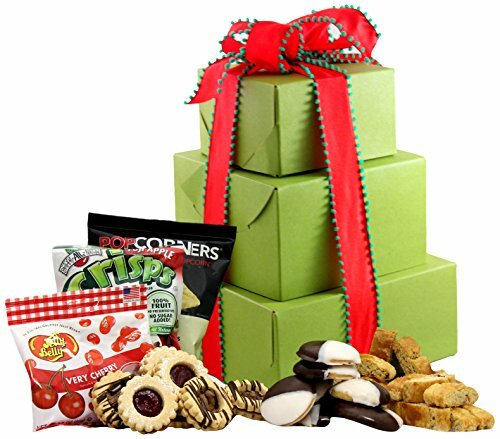 I am so glad that gluten free Christmas gift baskets are becoming more available now, and I wish more people knew they were an option. Last year I started working for a new company, and they sent all of the employees gift baskets full of yummy Christmas treats. It was a beautiful box and a nice surprise, but I couldn’t eat any of it because it wasn’t gluten free. I made the best of it, though, and my friends got really nice baked gifts last year. But I would have enjoyed getting to eat my gift basket myself rather than give it away. Hopefully my bosses are reading this, and I’ll get a nice surprise this Christmas! If you love to cook, you can never have enough cookbooks. It doesn’t matter if the same recipe is in three books, someone else always adds their own twist to a recipe. I know, because I have my fair share of gluten free cookbooks. Gluten free desserts, gluten free dinners, gluten free comfort food. You name it, there’s a cookbook for it. And if you love cooking, you’re going to want one of these top gluten free cookbooks. I actually own this cookbook, and love it. 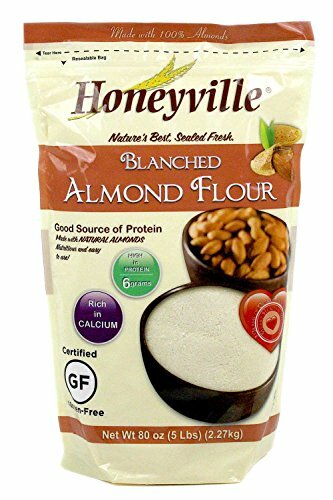 Almond flour is the go to flour for gluten free and low carb baking. But it can be hard to work with if you’ve never baked with it before. If you’re new to the gluten free way of eating, this is a perfect starter gluten free cookbook. 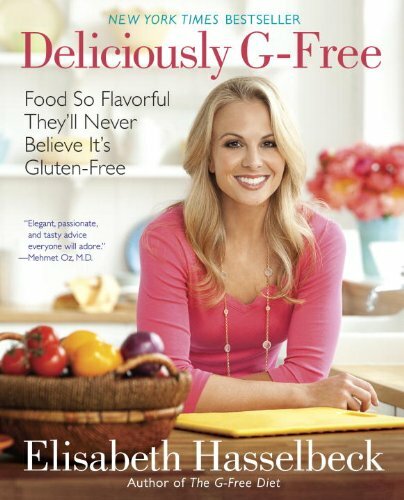 It has recipes for desserts, breakfasts, breads, and pretty much everything else us GF folks want to eat but can’t. 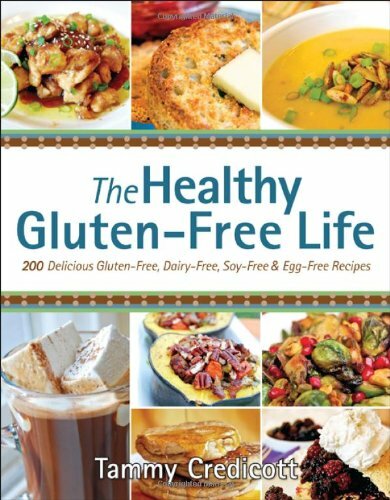 This healthy gluten free cookbook shows us how. Gluten free cooking is completely different than traditional baking. That’s why giving a gluten free cookbook as a Christmas gift is so thoughtful and useful, especially for those on your list that become gluten free later in life. I know I had to basically learn how to cook all over again because gluten free cooking can be so tricky to make it taste good. 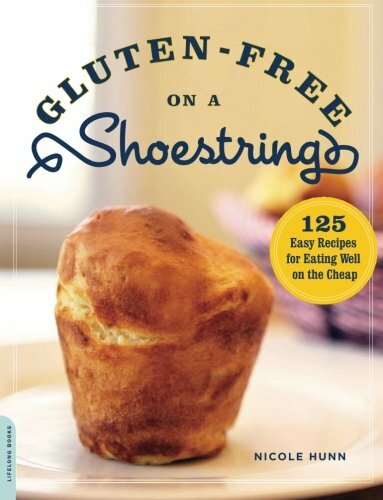 Gluten-Free on a Shoestring: 125 Easy Recipes for Eating Well on the Cheap Deliciously G-Free: Food So Flavorful They’ll Never Believe It’s Gluten-Free The Healthy Gluten-Free Life: 200 Delicious Gluten-Free, Dairy-Free, Soy-Free and Egg-Free Recipes! Gluten free cooking requires a lot of specialty ingredients, most of which can be hard to find depending on what you’re making. Buy a bag of almond flour, a sweetener, and a pretty baking dish. 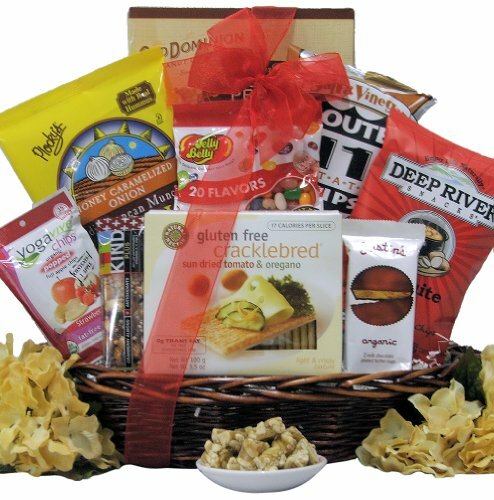 Put them all together and make your own gluten free baker’s gift basket. 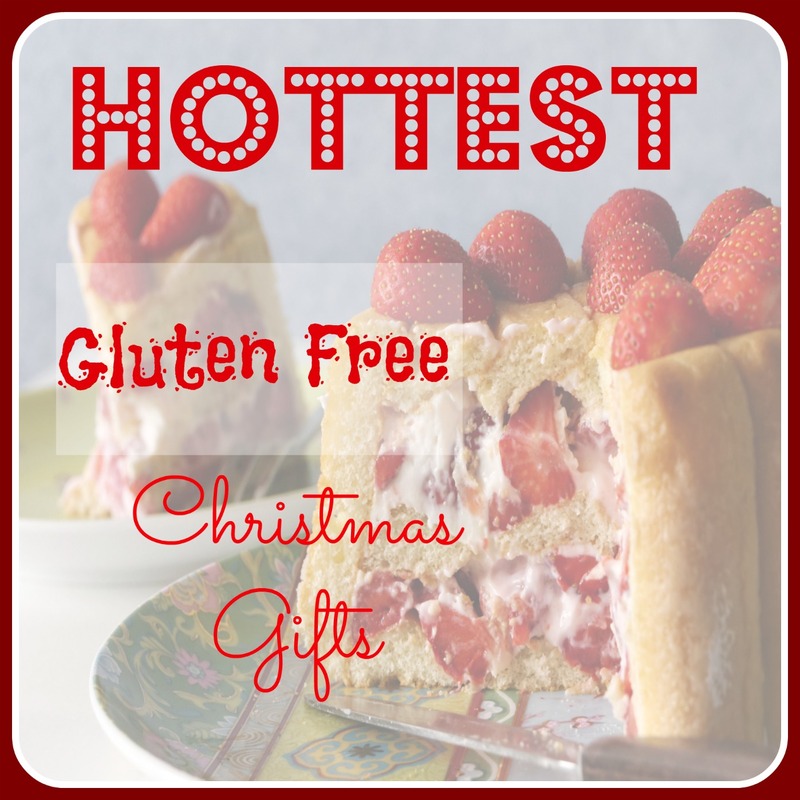 Now, those would be great gluten free gifts for Christmas a GF foodie would love! The holy grail for gluten free cooks is for a bread that actually tastes like, well, bread. It’s all but impossible to find a really good bread recipe, let alone a mix to make the whole process easier. 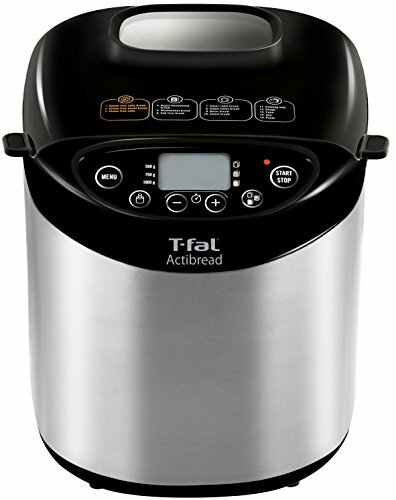 Manufacturer’s are catching up with the demand, and there are bread mixes and even bread machines that have gluten free settings. 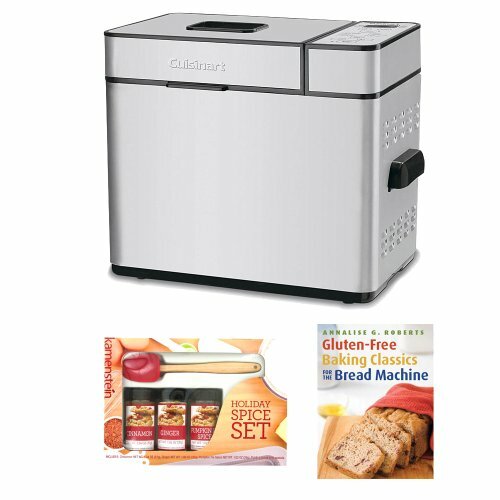 A bread machine isn’t something I’d really buy for myself because I’d consider it such a splurge, but if you gave me a bread machine, along with gluten free bread mixes, trust me, you’d have a friend for life. 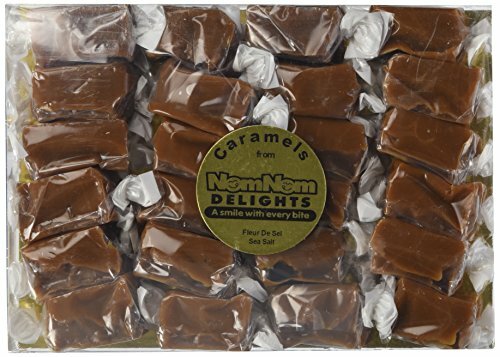 Gluten Free Gifts: Christmas Candy! 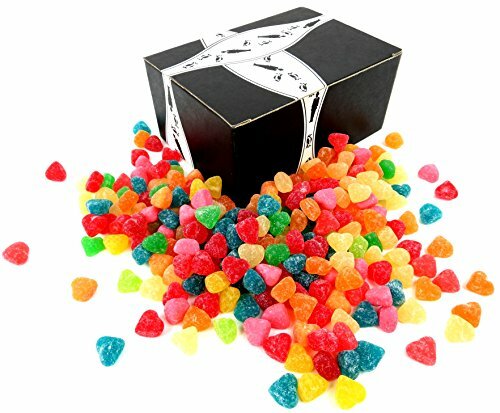 Did you know that gluten is an ingredient in most candies? I never knew that. 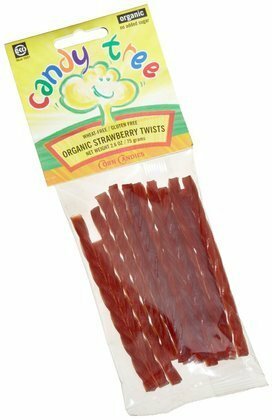 I was shocked to find out that wheat was a main ingredient in candies like licorice and some caramels. A lot of times, people assume it’s safe to give candy to someone who is gluten sensitive or a celiac, but it’s not. 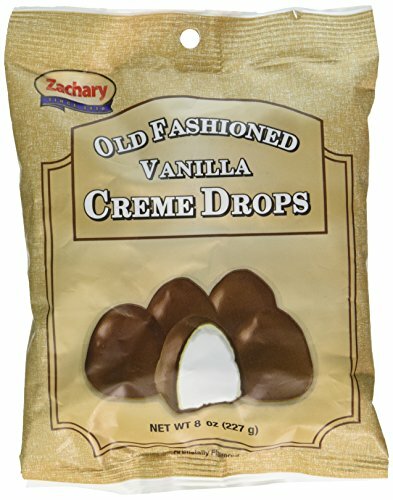 But there are gluten free versions of Christmas favorites, which is great because I’d be a scrooge if I couldn’t eat my chocolate covered vanilla creme drops every year! I think pasta ranks right up there with bread when it comes to what you want to eat when you’re gluten free but can’t. A great gluten free alternative for wheat spaghetti is vegetable noodles. I remember the first time I tried vegetable pasta, I used a vegetable peeler. It got the job done, but it took forever and a day. 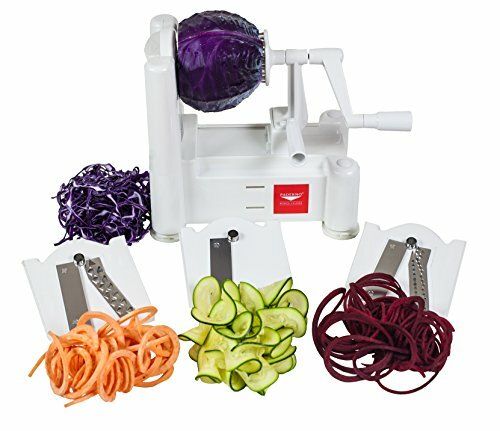 Now that there’s veggie twister spiral slicers, it makes the job so much easier and faster. 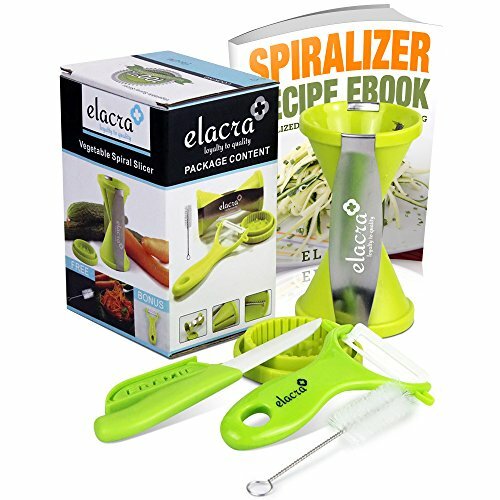 There are handheld veggie spiralizers which are great if you have limited countertop space or you’re not a big pasta eater. 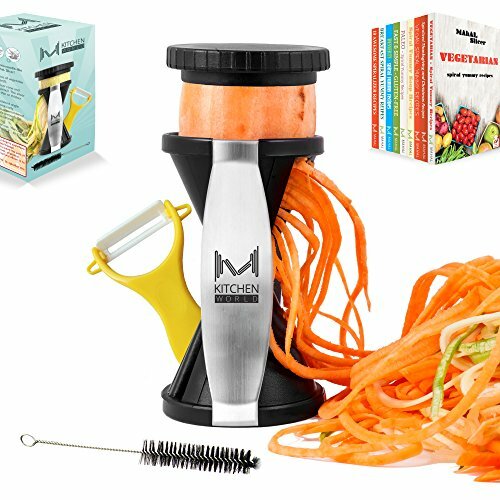 If you’re a major pasta lover, I’d go with a veggie slicer machine. When you have to make a lot of spaghetti for a crowd, they are really a time saver. 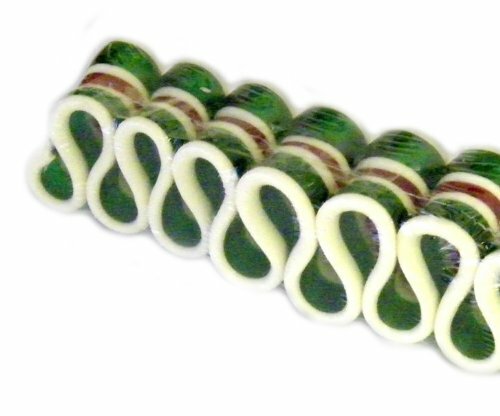 A veggie spiral machine is definitely at the top of my Christmas list this year.